If you’ve been to Asa Wright, you have almost certainly enjoyed our coffee. You will find it, percolating for you on the verandah before 6:00 a.m. each morning, just after the birds’ songs have pulled you out of bed! 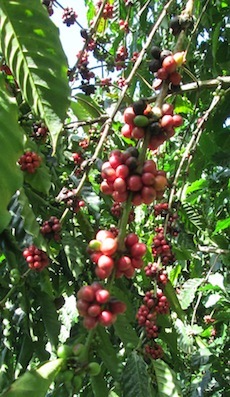 And you probably know that the coffee you are drinking is grown right here on the Spring Hill Estate. Indeed, it never leaves here, unless you purchase a bag or two and take them away with you. Our coffee is picked, dried, roasted and ground right here on the premises before you enjoy that early morning treat, sipping it to the sounds of Antshrikes and orange- winged parrots while you watch the mists rising in the valley below, as you hope to sight some Toucans! You are drinking our Organically-grown Robusta Coffee which is sold – only in our gift shop – under the brand name “Mountain Ebony”. Our coffee trees are growing on the slope above the driveway, accessed by a partly-hidden trail beyond the Clearwater Pool. The trail switches back and forth across the steep portion of the slope and then opens up to a relatively clear area filled with coffee and miscellaneous fruit trees. The trees put out beautifully scented, white flowers before the beans appear along the branches. The green beans turn to red and then to a deep claret colour when they are ready for picking. When picked, the beans are dried in one of our cocoa houses for about four weeks, before they are “hulled” and then roasted and ground, ready for your cup!